(CNN) -- The long-running Carlos Tevez affair was finally brought to a close on Monday as West Ham and Sheffield United reached an out-of-court settlement. 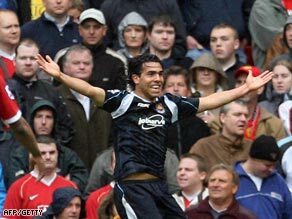 Tevez scored a crucial winning goal at Manchester United on last day of the 2006-07 season. West Ham will be paying United an undisclosed compensation fee to settle the dispute, meaning an independent tribunal chaired Lord Griffiths will not reconvene to rule on the controversy. A statement from Blades chairman Kevin McCabe and West Ham chief executive Scott Duxbury released to the Press Association said: "Both clubs are pleased to announce that a satisfactory settlement for compensation has been reached which brings the dispute between Sheffield United and West Ham to an end. "The tribunal will not be resuming." The Tevez controversy began in 2006 when the Argentina international and his fellow-countryman Javier Mascherano were signed by West Ham under third party ownership deals which contravened Premier League rules. Mascherano was later loaned to Liverpool, but Tevez stayed at Upton Park and played a crucial role as West Ham narrowly avoided relegation. He scored the winning goal as the Hammers beat Manchester United on the last day of the season to send Sheffield United down. Tevez later joined Premier League champions Manchester United, but the row lingered on with Sheffield United continuing to insist that West Ham had gained an unfair advantage. The affair has sparked three separate inquiries, the first of which led to a $8 million fine for West Ham, but crucially no points deduction. But United refused to give up and in September 2008 an independent arbitration ruled in their favor in a claim for compensation from West Ham. The Premier League and the Football Association promptly announced another fresh inquiry, but the out-of court settlement looks set to bring the affair to an amicable conclusion. West Ham, whose Icelandic owner Bjorgolfur Gudmundsson has been hard hit by the global economic downturn, were reported by Sky Sports News to be paying the compensation fee, which could rise to $35 million, in installments. The money will certainly be welcomed by Sheffield United, who are pressing for promotion from the Championship to the Premier League. "We are two clubs with a fantastic footballing history who now want to move on and focus on the business of playing football -- hopefully for us against the Hammers in the Premier League next season," said McCabe.